Libya- A new Euro-Med Monitor office is now open in Libya’s Tripoli as part of the organization’s work to strengthen the human rights situation in the North Africa region in partnership with the relevant organizations. “By opening this new regional office in Libya, the organization hopes to contribute to raising awareness of human rights as well as to document rights violations in North Africa in general, and in the Libyan territories in particular, especially in light of an ongoing armed conflict,” said Ihsan Adel, Euro-Med’s Chairman. “We look forward to working with official Libyan bodies and all relevant non-government agencies and organizations in North Africa to bring about real change in the situation of human rights in the region,” added Adel. “Many areas with a record of human rights violations have been for so long out of reach of most human rights groups. This step comes as part of an effort to be able to document human rights abuses, urge action to end violations, and to promote cooperation on local and international levels, particularly with United Nations agencies,” Adel further stated. 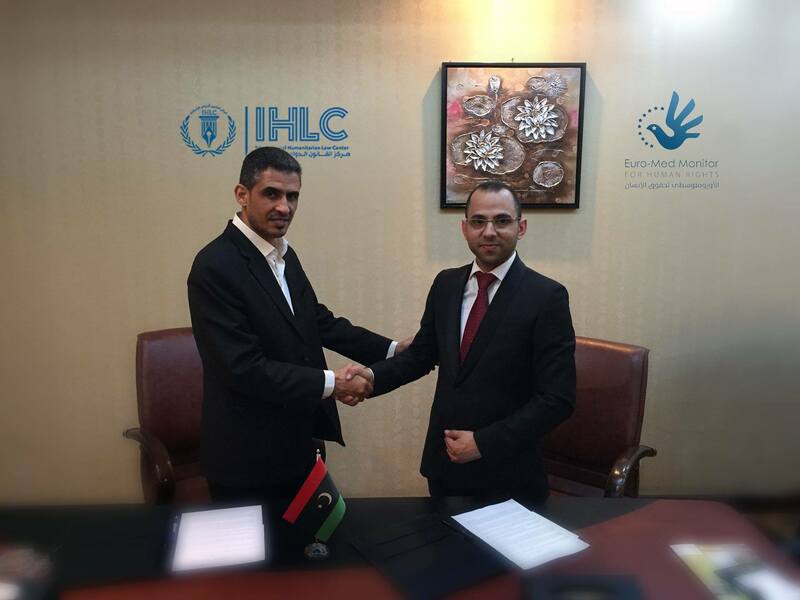 Euro-Med Monitor also signed a memorandum of understanding and partnership with the International Humanitarian Law Center in the Libyan capital of Tripoli, to implement joint projects in the country. The memorandum of understanding between the two organizations includes a cooperation to launch and implement a project aimed at documenting cases of torture and obtaining statistics on these tortures in Libya by all parties. Although statistics will cover the period from February 2011 until mid-2018, they will continue in the future with the IHLC working at a local level and Euro-Med Monitor providing technical support and working on the International level. The project includes the deployment of 60 researchers throughout Libya and the launching of a website to document all victims of torture, said Riyad al-Hamdi, IHLC director, concluding the project with a comprehensive report to be announced at the UN Palace on the sidelines of the Human Rights Council meeting with Member States. The second phase of the project will include psychological support and rehabilitation to victims of torture in cooperation with the United Nations Voluntary Fund for Victims of Torture. The memorandum of understanding also covers a planned legal clinic program for North Africa, which aims to provide training for students and graduates of human rights on international humanitarian law and human rights both in theory and practice. The trainees will be familiarized with the most important international principles and conventions. They will then be assigned to conduct field research, draft legal reports and human rights statements and provide legal advice relevant to the field. The importance of the partnership between the International Humanitarian Law Center and the Euro-Mediterranean Human Rights Monitor is reflected in the joint objectives and strategies of the two organizations in improving the human rights situation in North Africa, as well as in their support for initiatives and projects on legal awareness and monitoring of human rights violations. Their objective is to ensure the success of these projects to serve the human rights campaign in Libya and in the region as a whole.